Fires: The Detroit Fire Department responded to 3,034 calls during the seven days of the riot week. A total of 690 buildings were destroyed or had to be demolished. Two firefighters died and 84 were seriously injured. A fire expert who studied Detroit’s riot blazes concluded the “city had narrowly averted a firestorm” like those in Tokyo, Berlin other urban war zones during World War II. Dozens of suburban departments came to Detroit’s aid. Law enforcement: It took about 17,000 members of various organizations to quell the riot: Vietnam-hardened ‒ and integrated ‒ U.S. Army troops from the 82d and 101st Airborne units; Detroit Police; Michigan National Guard; and Michigan State Police. Observers generally praised the work of the well-trained army personnel and state police. Inexperienced and largely white national guard troops received widespread criticism for their lack of discipline. There were significant reports of verbal and physical abuse by Detroit police. There were also nearly constant rumors of sniper fire which, when combined with the long work hours during the uprising, left many officers exhausted and on edge. A tumultuous summer: Civil disorders of varying sizes broke out in 128 cities in 1967. Some cities had more than one riot; New York City had five. But Detroit’s disorder was by far the biggest that summer in loss of life and property damage, and is considered one of the worst insurrections in American history. A progressive mayor: Mayor Jerome Cavanagh was a liberal visionary. In the years before the riot, “he moved farther on racial issues than any other big city mayor,” wrote historian Kevin Boyle. Cavanagh, who was white, also aggressively embraced President Lyndon Johnson’s Great Society program, and Detroit became a so-called “Model City,” receiving millions in federal funds to finance Cavanagh’s ambitious Total Action Against Poverty program. But the city’s economy deteriorated in the 1960s as it had in the 1950s. Jobs, and white residents, fled to the suburbs, and Cavanagh never was able to control the abuses and systematic denigrations of the African-American by the nearly all-white Detroit Police Department. Sunday, July 23: The riot ignited when police raided a “blind pig” (an after-hours drinking and gambling club) at 12th Street and Clairmount – then a raucous commercial and nightlife district – at 3:30 a.m. Sunday. Looting and arson spread during the early morning and afternoon hours, as Detroit police officials employed a strategy of restraint, banning the use of tear gas and firearms and ordering street officers to passively contain the disturbance to the 12th Street area, where several thousand people had gathered, rather than take aggressive steps to make arrests. That initial strategy failed and was widely criticized. By 3 p.m. Sunday rioting spread west to Linwood Avenue, and the National Guard was mobilized. The rest of the week: After much haggling and vacillation among political leaders in Detroit, Lansing and Washington, battle-hardened, well-trained paratroopers were deployed Tuesday on the city’s east side, which they quickly pacified, while the National Guard struggled on the west side. On Wednesday, in one of the uprising’s most notorious episodes, three black teens were killed at point-blank range by police looking for snipers, while other young black men (and two white women) were roughed up at the seedy Algiers Motel. (Only one officer went to trial for the shootings; he was acquitted by an all-white jury). Started a trend of high-crime rates – especially homicide – and arson fires that continued for decades. Led to the election of Coleman Young as Detroit’s first black mayor in 1973. Gave rise to Detroit’s image internationally as a volatile urban war zone, an image the city is still trying to shed. “Black Day in July,” by Gordon Lightfoot. “Det.riot ‘67,” by Moodymann (Kenny Dixon Jr.), a Detroit-based techno/house musician. David Bowie’s “Panic in Detroit” is sometimes described as inspired by the events of 1967, but it is also said to be based on his friend Iggy Pop’s recollection of the city’s revolutionary era during the late 1960s. “Violence in the Model City: The Cavanagh Administration, Race Relations, and the Detroit Riot of 1967,” by Sidney Fine. The 648-page tome by the late University of Michigan historian remains the definitive account of the riot. “The Algiers Motel Incident,” by John Hersey. The famous chronicler of Hiroshima after the atom bomb examined the execution-style deaths of three young black men during the riot in a motel at Virginia Park and Woodward. “Whose Detroit? : Politics, Labor, and Race in a Modern American City," by Heather Ann Thompson. Thompson sorts through the riot’s aftermath, including white flight, radical labor activism, conservative white homeowners, radical white activists and the election of Mayor Coleman Young. “The Origins of the Urban Crisis: Race and Inequality in Postwar Detroit,” by Thomas J. Sugrue. Published 20 years ago, “Origins” became famous for its multi-faceted description of Detroit’s decline and its obliteration of the idea that the riot was largely responsible for the city’s 21st-Century woes. “The Anatomy of a Riot: A Detroit Judge's Report,” by James H. Lincoln. “The Detroit Riot of 1967,” by Hubert G. Locke. “them,” Joyce Carol Oates’ 1969 novel, contains important scenes that take place during the riot. “Middlesex,” Jeffrey Eugenides’s 2002 novel, also uses the riot as a backdrop. 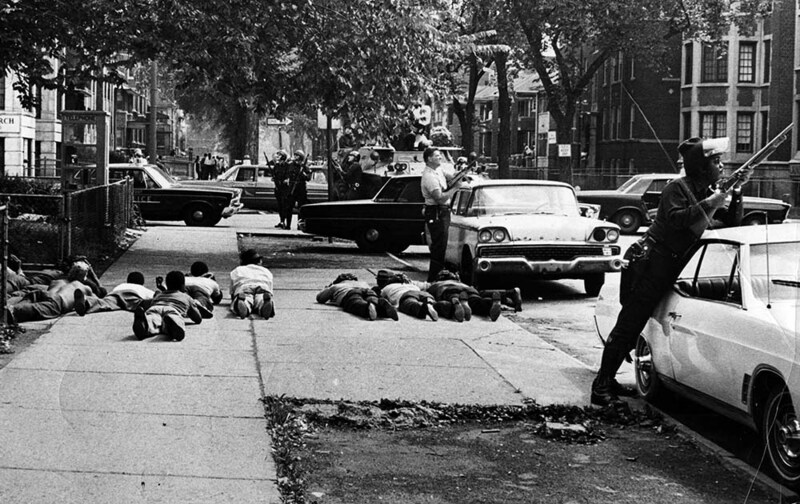 “Violence in the Model City: The Cavanagh Administration, Race Relations, and the Detroit Riot of 1967,” by Sidney Fine; Detroit Free Press, Detroit News; The Detroit Almanac, “After the Rainbow Sign: Jerome Cavanagh and 1960s Detroit,” by Kevin Boyle. ; Report of the National Advisory Commission on Civil Disorders;” Seven Fires: The Urban Infernos That Reshaped America,” by Peter Charles Hoffer. A well written and artfully cited piece. This article clearly points to a breakdown in the Cavanagh Administration and their belief that liberalism was the savior of the inner city. Additionally, the underlying fact that liberalistic philosophies lead to a series of poorly executed decisions which further escalated and ripped the Detroit city to pieces, both nationally and globally. Liberalism has betrayed inner-city residents for decades, as a result, and continues to promote those ideals on a population which is underserved, over-regulated, and feels that the government (the liberal government, mind you) has betrayed them. Yet they still sell the Democratic National Party as their end-all, save-all. Blaming liberalism for Detroit's problems is at best simplistic. Chuck, Are you saying that the government policies out of Washington and the policies in Detroit over the past 60 years weren't significant factors in the situation Detroit finds itself into day? Are you suggesting that if all the contributing factors aren't included, aren't addressed equally, are too simplistic that they should be excluded from consideration? Would you consider the lack of education/learning by the children in Detroit a contributor to the current situation? Or is it too simplistic so we should ignore it? If lack of academic success were to be something to address should we be interested in the things that contribute to it? It seems that in 1960 the proportion of black children being raised by a single parent was 22%, in 1995 those raised without a father present was 85%. [see Wealth, Poverty, Politics page 154 for footnotes on these numbers] As I recall New York Senator Patrick Moynihan (He was attack for promoting racism.) predicted this type of breakdown in the family when he opposed Aid to Dependent Children back in the early 1960s. This seems simplistic. That leads back to your view that claiming 'liberal' policies is simplistic. We go to a root cause of a problem and address it or we keep paying for a symptom and never fix the problem because it as to 'simplistic'.Your choice! I am for addressing the root cause and fixing the problem, simplistic or not. Forgotten in the criticism if the Michigan National Guard's discipline during the riot is the fact that these men were put in the line of fire because these Signal Company men were the only troops available for the police to use in the early stages, and we were trained to send communications, not fight a riot. We had never had any riot training, and we didn't even have an army manual for it either. We were told to listen to the patrolman whom we were assigned to, usually 3 guardsmen to one cop. We were issued Korean and WWII carbines with only 5 rounds of ammunition because that is all we had in our armory at the time. Everyone was scared because we didn't know what to expect, even the cops. Things settled down some after a couple of days. Then the Army was finally brought in, with their tanks and many more troops. I thought the Guard and cops did a pretty good job at containing things until then, considering we didn't have the manpower or equipment until Army reinforcements came. My unit was deployed on the west side, and saw help later than the east side.